Bangkok. A sprawling city of modern skyscrapers, ancient temples, criss-crossing highways, and swanky shopping malls. A city where the word “chaotic” does not even begin to describe it. A city that is basically the heartbeat of Thailand; the center of Southeast Asia. Even though I know people who name Bangkok as one of their favorite cities in the world, I purposefully didn't plan to spend a whole lot of time there. After being overwhelmed by the amount of people in Hong Kong and the amount of motorbikes in Hanoi, I was perfectly happy to limit my time in Bangkok to just 2 nights — essentially leaving me with just a little more than 24 hours in the Thai capital. So what does one do with 24 hours in Bangkok? 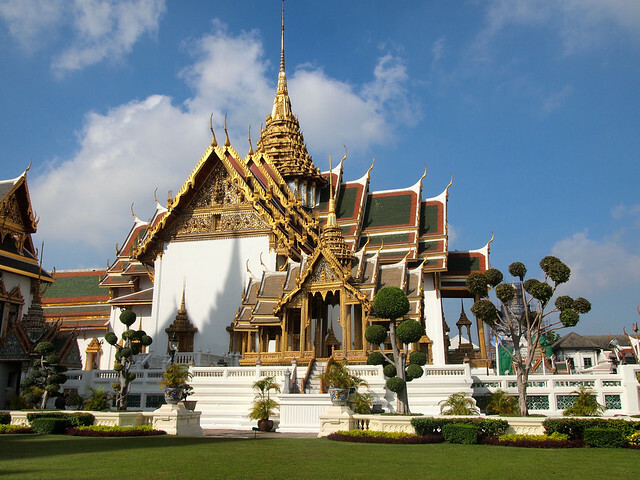 The Grand Palace, located in the heart of Bangkok along the Chao Phraya River, is one of the city's top tourist attractions — and for good reason. 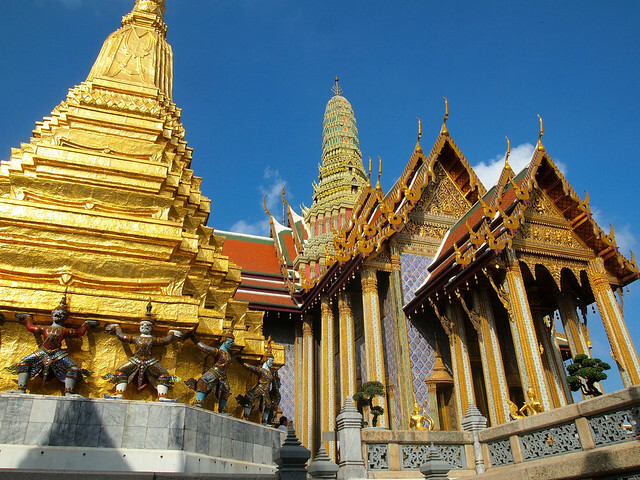 The complex is also home to Wat Phra Kaew, the Temple of the Emerald Buddha, which remains one of the most sacred temples in all of Thailand. 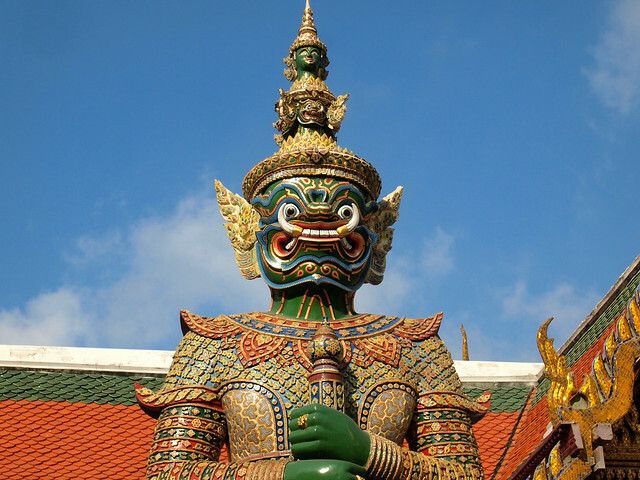 You can walk to the Palace from the Khaosan Road area or take a river taxi from elsewhere in the city, and then easily spend a couple hours exploring the grounds and temple. Travel tip: Go EARLY, and don't listen to anyone (tuk-tuk driver or otherwise) who tries to tell you that the Palace is closed. 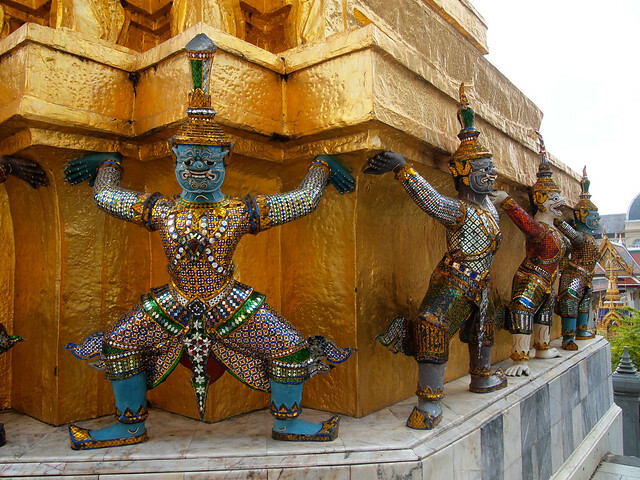 The Grand Palace is open 7 days a week, nearly 365 days a year. Gates open at 8:30 a.m., and I would advise arriving right around then to avoid both the crowds and the worst heat of the day. You'll have to pay an admission fee of 500 baht (a little less than $16 USD) if you're not Thai, and you will need to ensure that your shoulders and knees are decidedly covered. 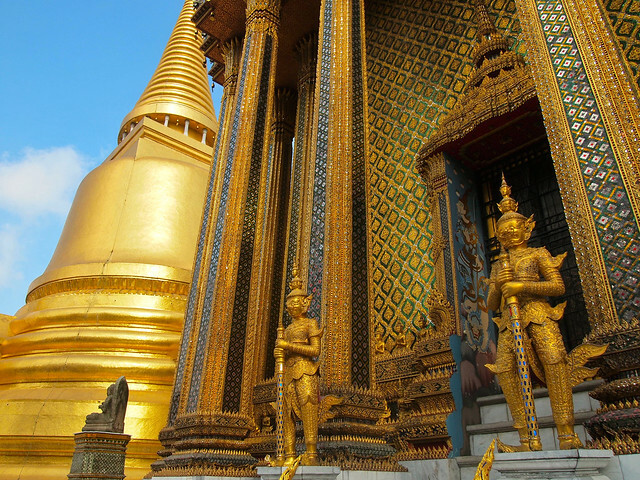 From the Grand Palace, it's an easy and quick trip to either Wat Pho or Wat Arun. 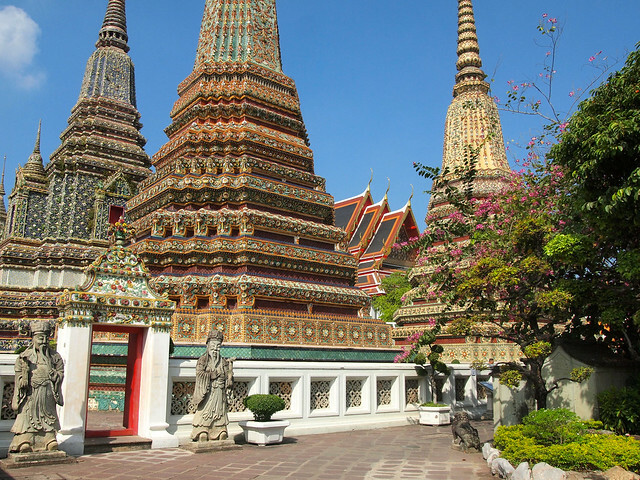 I chose to visit Wat Pho since it was just on the other side of the Grand Palace — and because I wanted to see the temple's famous 150-foot Reclining Buddha. 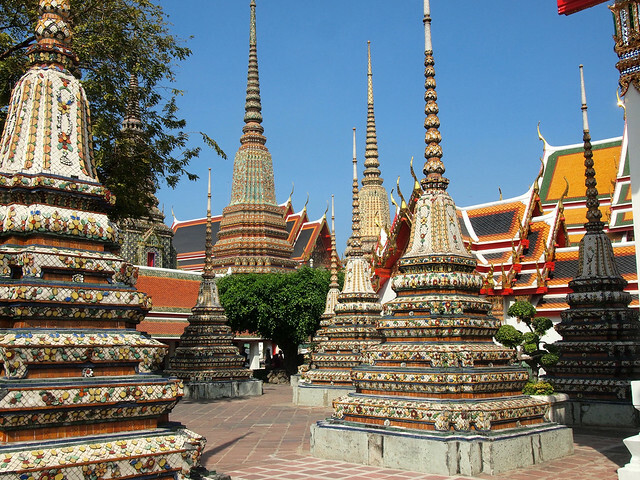 This is the oldest and largest temple complex in Bangkok, and also the reported birthplace of Thai massage. It costs just 100 baht ($3 USD) to enter, which includes a free bottle of water. 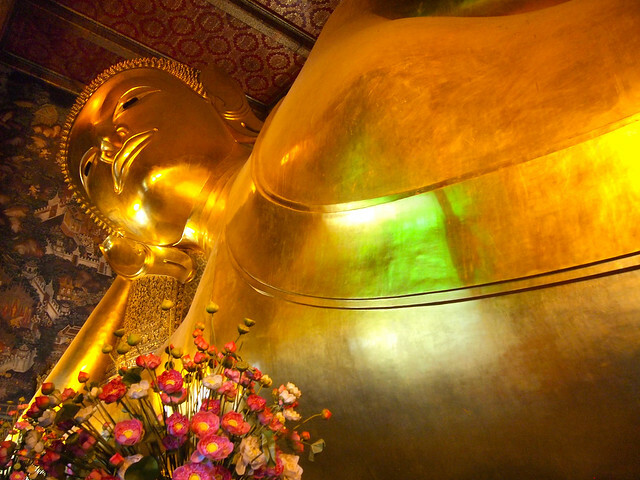 Travel tip: Don't just pop in to see the Reclining Buddha, though; spend some time exploring the rest of the massive temple complex, too. 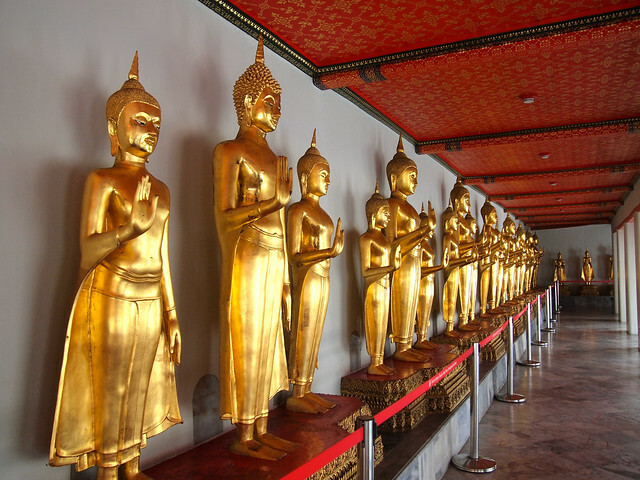 You'll find a huge collection of gilded buddhas, detailed stupas, and some beautiful spaces to just stroll and relax. 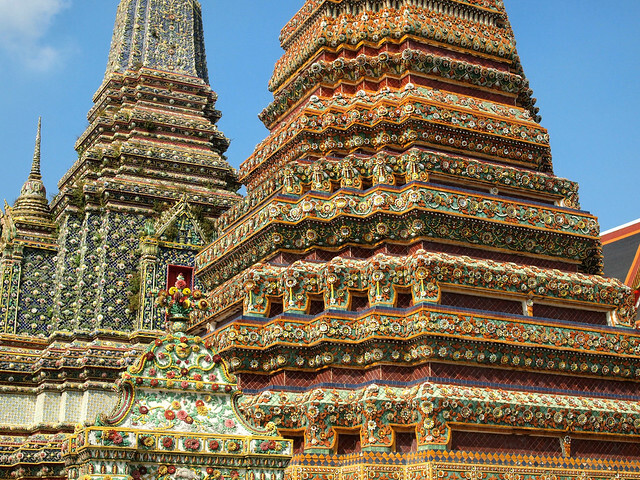 After you wrap up at Wat Pho, either hail a tuk-tuk/cab, or hop on a ferry that will take you back to a SkyTrain stop. 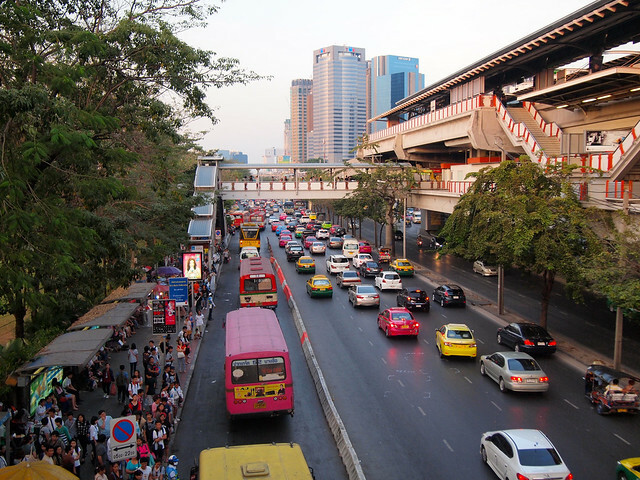 From there, take the train (or a taxi, if you prefer) to Mo Chit for the Chatuchak Weekend Market. 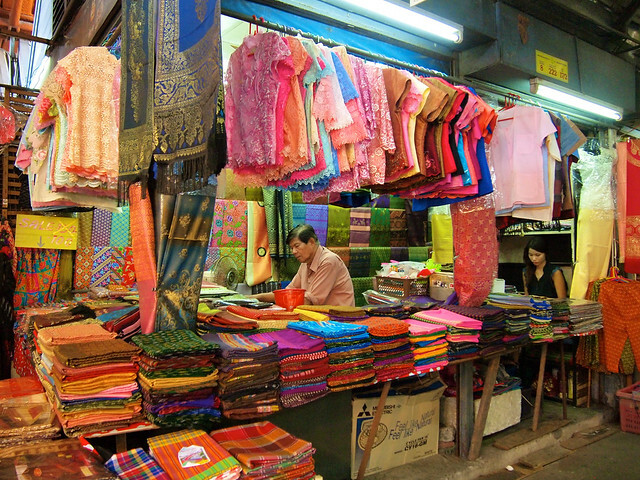 The Chatuchak Weekend Market is one of the largest and most diverse markets in Bangkok. On the weekends, more than 15,000 stalls sell everything from artwork to old books to designer clothing, and the market is reported to get more than 200,000 visitors per day. It's a place where you could EASILY spend an entire afternoon, whether you're shopping for gifts and souvenirs or an entirely new wardrobe. Travel tip: Plan to grab your lunch here, as there are plenty of affordable food stalls. And, of course, don't be afraid to haggle for anything you buy! While the market is just as popular with locals as with tourists, that doesn't mean that you can't try to get a better price than what is first quoted to you. Also, be sure to ask where to find the section of the market reserved for young, up-and-coming designers. You can find some really unique things for sale here (assuming you are small enough to fit into “Asian sizes”). I'm not into the drinking or the drugs or the ping-pong shows (or worse) that this area is known for, but I still wanted to see the infamous Khaosan Road for myself at night. It turned out that I was staying just a block away, so it was easy to pop over after returning from the market. The road was exactly what you would expect — full of street vendors and lined with bars blaring Western music and advertising drink specials. To be honest, it wasn't nearly as over-the-top as I expected it to be, and I was largely unimpressed. If Party Central isn't your thing, consider grabbing dinner and a movie at one of Bangkok's many luxury movie theaters. Just about every major shopping mall in the city has a swanky movie theater inside it, and a few offer buffet dinner-and-movie specials for just a little over $20 USD (which includes dinner, a recliner-like seat, and free drinks/popcorn throughout the English-language movie). There sadly wasn't anything playing that I wanted to see at the theater I popped my head into, but this is something I will definitely be doing if I ever find myself back in Bangkok! So there you have it. A jam-packed 24 hours in Bangkok. There are still plenty of things I would add to my “next time” list in Bangkok — like going to Wat Arun and spending a morning at the floating markets — but I think this was a great introduction to the city. 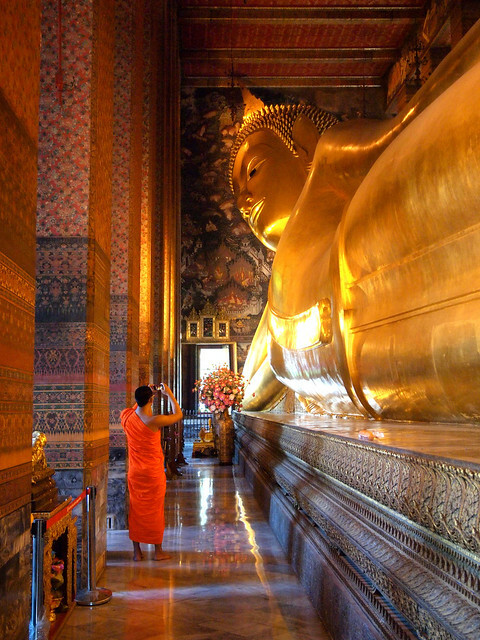 What are some of YOUR favorite things to do in Bangkok? Wow, this is such an interesting list. The more I read on here, the more alike we seem to think. I don’t think I’d be up for the Ping- Pong Show Khao San Road thing at all, but definitely like the sound of the movie and dinner thing, haha! The temples look beautiful too. I actually have thought about avoiding Thailand altogether when I eventually go to Asia, hoping I can possibly fly through Singapore instead, who knows?! We’ll see when I get around to booking it. I would not advise you to skip Thailand! Bangkok can be a little overwhelming, sure, but the country has plenty of other places that are much more laid-back. And, to be honest, I’m glad I spent a couple nights in Bangkok. Going to the Grand Palace and temples was a huge highlight! Bangkok could definitely be that kind of city, Renuka! Awesome, Lisa! Also, definitely take advantage of the ferries and water taxis to get around… a lot of people forget that there’s a river running through Bangkok! Great suggestions! I found Bangkok to have an attractive quality that I couldn’t quite identify. Generally, I don’t enjoy large, busy, crowded cities, but there was just something about the energy in Bangkok I found…appealing somehow. I can understand that, Sam. Bangkok isn’t a place I would want to live, but it DID have a very unique quality to it. In the end, I’m glad I spent some time there. 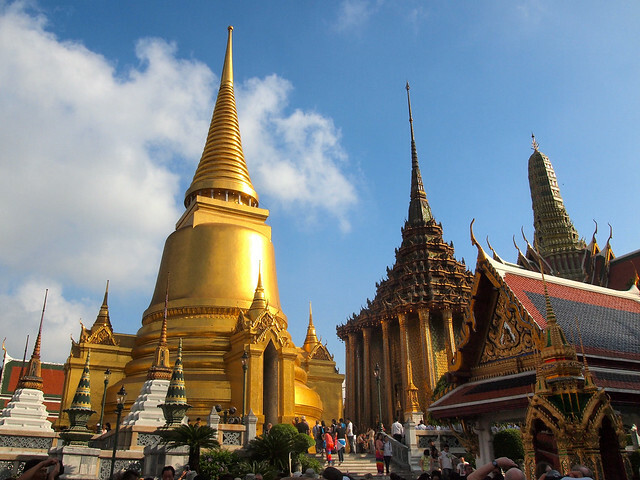 I loved visiting the temples and Grand Palace. They are so beautiful and colourful. Was so annoyed that my photos of the reclining buddha (among others) got wiped from my memory card. Wish I had more time to visit the markets. But there is always next time! There is indeed always next time! But yeah, I would have been bummed, too! Those temples look amazing. 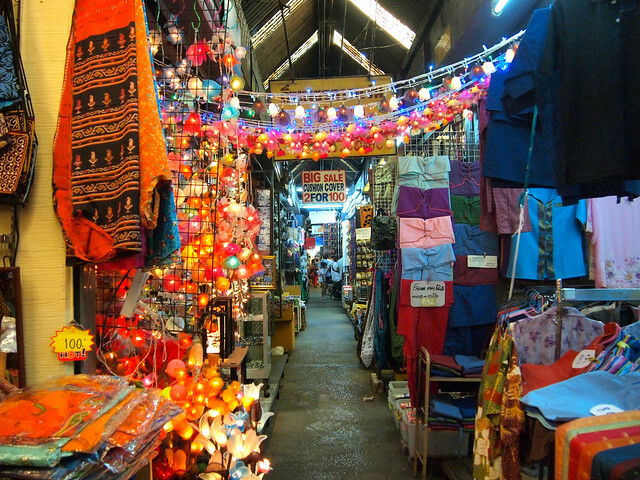 Also I love visiting markets everywhere I go and the one you recommend sounds awesome! 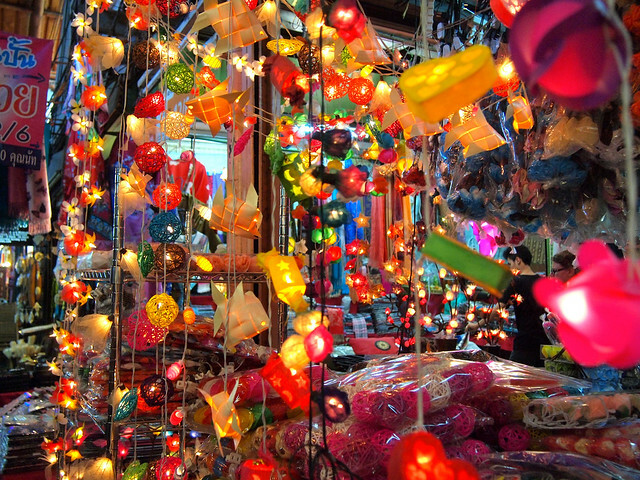 The Chatuchak Market is probably one of my favorite markets anywhere ever! It was really fun to spend an afternoon there. Thanks for those suggestions! I’d definitely love to check out some of those sky bars next time. We actually took 3 different ones and thought they were all excellent. Knowledgeable friendly guides, great food, areas of the city that were a bit less touristy and that we would not have explored on our own. They were the highlight of our stay in Bangkok. Great suggestion! I would definitely add that to my “next time” list! Great photos! I’m trying to do some planning for my future trip to Thailand. Is there anything you didn’t get to do that you wish you did do? So much! I would have liked to go to the floating markets and to Wat Arun, as well. And I’ve heard there are some great food tours in Bangkok, too! I spent some time relaxing in Lumphini Park one day and I greatly enjoyed watching people called the kick volleyball sport (I forgot its proper name). So that’s a place I would recommend. I had hoped to make it out there, too, but simply ran out of time! 24 hours is quite a long time for a short visit. I’ve spent around 3 hours in Osaka and around 3 hours in Lisbon, when I was first there. It wasn’t bad at all! In 24 hours, you can dig deeper in Bangkok… wonderful photos, by the way! Knowing how much there is to see and do in Bangkok, though, 24 hours is nothing! Another great article! Thanks for the information and well-planned itinerary. 24 hours is such a short period of time but your itinerary really maximises every minute of it! That’s definitely my travel style – make the most of whatever time I have! You have to explore more places in Indonesia to get inspirations. thanks for your post, the photos are fantastic. I know Bangkok quite well, I love the city. I actually like walking around the streets with hardly any tourists or expats, always see something new that way. I’ll bet! 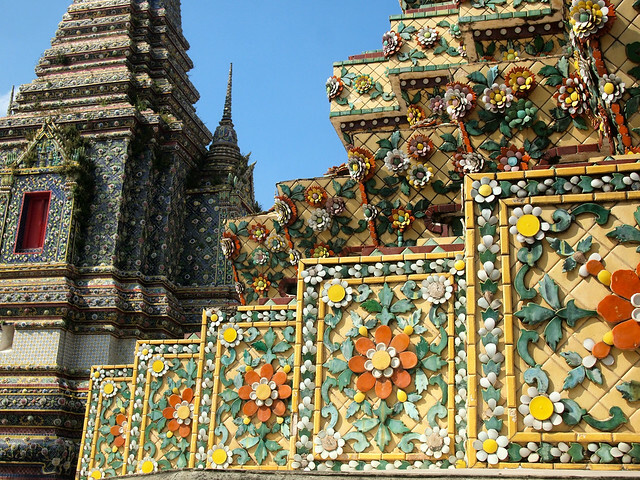 Bangkok is so big and so diverse – you could spend so much time there, and still find new things to notice or discover. You have shown very nice picture of Bangkok. Thanks to suggest us that how to visit here in 24 hours.